1 more week to register for West Seattle Community Garage Sale Day 2019! Reminder time! If you are still deciding whether to have a sale on Saturday, May 11th, as part of the 15th annual West Seattle Community Garage Sale Day – registration is open for one more week, until next Thursday, April 25th. That’s when we get busy mapmaking! So far more than 150 sales are registered – from individual sales to block sales to business sales, moving sales to kid-stuff sales, “vintage” sales, furnishings, collectibles, sports gear, holiday decorations, kitchenware … if you’re looking for something and don’t mind that it’s used, WSCGSD will be the day to find it. We publish the map in clickable and downloadable versions one week in advance so shoppers can plan, and that’s why we cut off registration. So if you’re ready to sign up your sale, don’t wait – just go here now! One month until WSCGSD 2019 – two more weeks of registration! Almost 100 sales are registered for the 15th annual West Seattle Community Garage Sale Day – now just one month away, coming up on Saturday, May 11, 2019! Big, small, north, south, east, west, you’ll find sales that day all over the peninsula. Ready to sign yours up? Registration continues for two more weeks – start by going here! 245 sales and rising as we approach the deadline — Thursday night is your last chance to sign up for West Seattle Community Garage Sale Day 2018 (which is happening on Saturday, May 12th). Big sale? Little sale? Inbetween? Apartment complex courtyard? Full garage? School? Business? Or … ? It’ll be a day of sales of all sizes, all locations, as always … this is the 14th year for West Seattle Community Garage Sale Day and we’re excited! As soon as registration closes, we get to work on the map and list so they’ll be available a week in advance for all those buyers to plan! So don’t procrastinate … sign up YOUR sale now … thank you! Quick update – if you’re planning on a sale for West Seattle Community Garage Sale Day 2018, you have five more days: Thursday night (April 26th) is the deadline to register. We’re close to 200 sales already, but we know from coordinating WSCGSD for 11 years now that many wait to decide until the last few days of signups – so if you’re ready to commit, go here! The big sale day – sales of all sizes, in neighborhoods all over the peninsula – is Saturday, May 12th, just three weeks away. 120 sales and rising as West Seattle Community Garage Sale Day 2018 gets closer! Now just under four weeks until Saturday, May 12th – this year’s West Seattle Community Garage Sale Day – and 120 sales are signed up! Every single year, the variety is amazing, in sale size, sale items, sale locations, and this year is looking great too. We are midway through the registration period and the rest of the time will roar by, so if you’re planning a sale but haven’t signed up yet – go here to get it done! One week now since we started registering sales for Saturday, May 12th, this year’s West Seattle Community Garage Sale Day, and 85 sales are on the list – all sizes, all over the peninsula, all sorts of items. It’s the biggest community garage-sale day in the city so far as we can tell, and this will be its 14th year, a tradition still going strong. If you’re planning to sign up, you still have two weeks – just be sure you have your up-to-20-words “ad” ready to include once you start filling out the registration form! Official sale hours are 9 am-3 pm on May 12th but you are welcome to run longer – with an early start and/or late end – just be sure to mention that in your ad, too. 70 sales for West Seattle Community Garage Sale Day 2018. Ready to sign up? We’re still in the first of three weeks of registration for West Seattle Community Garage Sale Day 2018, and 70 sales are already signed up – including the group site at Hotwire Online Coffeehouse (4410 California SW in The Junction), half a dozen businesses, and lots of awesome sales of all sizes, all kinds of items … clothes, toys, houseware, antiques, furniture, books, music, sports gear, and that’s just barely scratching the surface. Official sale hours on Saturday, May 12th, are 9 am-3 pm, but sellers are welcome to start earlier and/or end later, and some already have announced they’re doing that – shoppers come from miles away (we’ve heard of people coming from Eastern Washington just for WSCGSD). Having a sale but not signed up yet? You have 2+ weeks BUT why procrastinate? Get on the list now! More than 30 sales already for West Seattle Community Garage Sale Day 2018! After the first day of registration for West Seattle Community Garage Sale Day 2018 – coming up on Saturday, May 12th – we are already past 30 sales signed up, and they’re all over the peninsula, from South Delridge to North Admiral, Alki Point to Pigeon Point, and beyond! We have individual, group, and business sales on the list already, too. Official sale hours are 9 am-3 pm on May 12th but sellers are welcome to start early and/or end late – be sure to include that info in your ad text if/when you are signing up. Speaking of which – here’s where to register! And if you’re planning to shop, watch for the map/list, printable and clickable versions, to be available one week before sale day, here and at our parent site West Seattle Blog. Registration deadline Thursday, as West Seattle Community Garage Sale Day 2017 approaches! If you’re planning a sale for West Seattle Community Garage Sale Day 2017 – the thirteenth year of sales of all sizes, all over the peninsula – you have until Thursday night (April 27th) to sign up! So far, more than 220 sales are on their way to the map, and if you’re joining, we’re looking forward to hearing about yours too. Just go here! If you’re looking forward to shopping … 9 am-3 pm Saturday, May 13th, is the official timeframe for WSCGSD, but some sales will start sooner, some will run later, some even might start Friday and/or run through Sunday – that’ll be in the listings accompanying The Map, which will be out May 6th, giving you a full week to plan. More updates to come! Four weeks until sale day and 100 sales are now signed up! Still more than a week and a half to register yours – go here. WEST SEATTLE COMMUNITY GARAGE SALE DAY 2017: Registration soon! If you’re here looking for information on West Seattle Community Garage Sale Day 2017 – good news! As always, the big day is the second Saturday in May, and this year, that’s Saturday, May 13, 2017. We always open registration in early April, and for this year, we’ve set the date – April 5th. Probably in the afternoon or evening, so when we’re ready to get going, we’ll post the link here and on our main site, West Seattle Blog. In the meantime, start thinking about the 20 words you’ll use to highlight your sale. Unusual item(s)? Popular item(s)? Offering refreshments? Catchy name for the sale? Or … ? 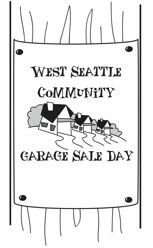 ABOUT WSCGSD: This will be the 13th annual West Seattle Community Garage Sale Day – tenth one coordinated by WSB, after its founders at a community-connection nonprofit called Megawatt presented it for the first three years, then deciding to disband and seeking someone else to take it over. It’s not one big sale, but rather many sales of all sizes, all over the peninsula, depending on who signs up and where they are – individual homes and apartments, block sales, schools, nonprofits, businesses, etc. The official hours are 9 am-3 pm, but you can start early and/or end late (and if you do, put it in your sale ad), as long as you are open those six hours that we promote for all sales. All the registered sellers’ information and locations goes into a map package that we make available one week before WSCGSD so you can start planning! Make money! Meet shoppers from near and far! One more week to sign up for West Seattle Community Garage Sale Day 2014! One more week to sign up your sale for West Seattle Community Garage Sale Day on May 10th – registration closes next Wednesday night, April 23rd. So far, 160 sales of all sizes are on the map (well, awaiting their place on it – the mapmaking doesn’t begin until registration ends) … including schools, service groups, businesses, and lots of great individual sales … you can join ’em by registering your sale here. West Seattle Community Garage Sale Day registration update: 120+ sales! About a week and a half left to go before the registration deadline, four weeks until sale day, and as of this very moment (drum roll,please) … 126 sales are signed up – big, small, inbetween – so another great day is definitely in store! If you’re just finding out about this, we (publishers of West Seattle Blog) coordinate the annual West Seattle Community Garage Sale Day, second Saturday in May, which means May 10th this year, and registration is open until April 23rd – so if you’re interested in having a sale, sign up here! If you don’t have room for one, or don’t have all that much stuff, check in with Hotwire Online Coffeehouse in The Junction or C & P Coffee Company between Alaska and Morgan Junctions – both are group sites with room for multiple sellers. And if you love shopping but don’t really need anything … we’ll have an option for you too – WestSide Baby is going to be out with a wish list of items you can shop for and then donate, same-day. More to come! Less than 48 hours into registration for West Seattle Community Garage Sale Day – the 10th annual event, this year on May 10th – and 30 sales are registered! GO HERE to sign up your sale. P.S. If you don’t have enough room for a sale of your own, check with Hotwire Online Coffeehouse ASAP to see about getting some space, free, at the group site in the Hotwire courtyard again this year. info@hotwirecoffee.com is where to inquire. Registration for the 10th annual West Seattle Community Garage Sale Day starts on March 31st! Two weeks until we open registration for this year’s WSCGSD (which is 9 am-3 pm May 10th, always the second Saturday in May). Stand by for more! If you’ve been waiting for a deadline reminder to decide whether to have a sale on West Seattle Community Garage Sale Day 2013 – here you go: Next Wednesday, April 24, is Deadline Day; 11:59 pm that night is when we have to close registration so we can get busy with map-making, in order to have both version of the WSCGSD map ready – clickable online version and printable PDF version – by the weekend BEFORE the big day, so shoppers have time to plan their routes! Ready to register? Here’s the form.